Joy Creek Photo Archive (c) all rights reserved A 2013 Joy Creek Introduction. 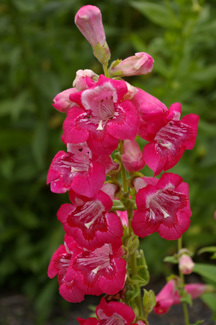 This is the second "flaired" penstemon we have released and joins our earlier introduction, 'Raspberry Flair'. Here, the extra large flowers have coral pink lips and broad dark raspberry guidelines in their throats that remind us of "flairs." The flowers are arranged in somewhat triangular, one-sided racemes that often contain up to forty flowers per stem. Like all of the garden penstemon, Penstemon `Coral Flair' wants good drainage, occasional summer water and sun. Summer to early autumn. 2.5 ft. x 2.5 ft.